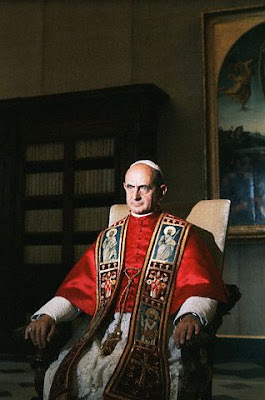 Fr Z has an excellent podcast analysing Pope Paul VI's General Audience address for 26 November 1969 in which he speaks about the "liturgical innovation of the new rite of the Mass" which was to be introduced on the first Sunday of Advent, four days later. But there is still a practical difficulty, which the excellence of the sacred renders not a little important. How can we celebrate this new rite when we have not yet got a complete missal, and there are still so many uncertainties about what to do? Those of us who were around at that time remember that for years every altar was littered with booklets and bits of paper to keep up with whatever had recently changed in the rite of Mass by way of texts, translations and temporary books.